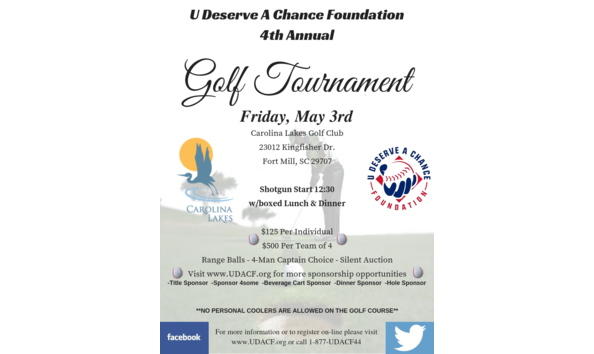 18 hole four man captains choice golf tournament to support under served in the community and their dreams of playing youth athletics. Registration will begin at 10 am with lunch, dinner and a shotgun start at 12:30pm. The event will include a raffle, 50/50 and winning prizes for the top teams. There will also be plenty of adult beverages to make sure we can raise as much money as possible! Lunch sponsor will be given the opportunity to bring one foursomes, signage at registration and at lunch. Description: We at the U Deserve a Chance Foundation work hard to level the playing field in youth baseball for players as well as hometown recreation organizations. We are a non-profit organization created to promote the game of baseball in communities and to develop young baseball players.